A strong second half display earned Aberdeen a share of the spoils at St Johnstone. The Dons trailed at half-time following a poor opening 45 minutes but a much improved showing in the second half, culminating in Niall McGinn’s equaliser, ensured the points were shared at McDiarmid Park. Summer signing Chris Forrester was handed his first competitive start for the Dons following his move from Peterborough United. The midfielder replaced Lewis Ferguson. Scott McKenna made his return to central defence taking the place of suspended team-mate Mikey Devlin. 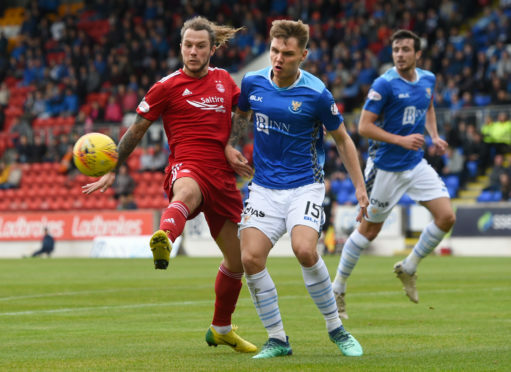 The Dons started on the front foot, forcing a couple of early corners but a deflected Niall McGinn shot was all they could muster and it was St Johnstone who made their corner count as they took a 16th minute lead. David McMillan got the important touch as he ran clear of Shay Logan to beat Joe Lewis at his near post with a bullet header from Drey Wright’s delivery. Aberdeen struggled to mount a response and a Stevie May effort, which was easily held by Zander Clark in the Saints goal, was the only effort of note in what was a flat first 45 minutes from Derek McInnes’s side. The introduction of Sam Cosgrove from the bench gave the Dons a much needed aerial presence in the second half and Aberdeen created several chances as they chased an equaliser. Gary Mackay-Steven saw one shot cleared off the line and another saved while Niall McGinn and Cosgrove had shots saved by Saints goalkeeper Zander Clark. Something had to give and Saints’ resistance was broken in the 69th minute when McGinn curled a free kick past Clark from 20 yards to earn his side a point.